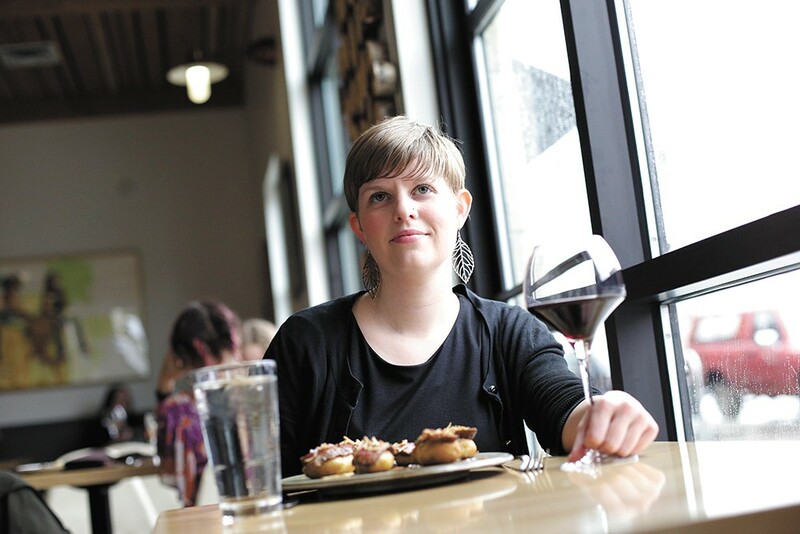 Writer Cara Strickland enjoys a meal and glass of wine solo at the Wandering Table. I still remember the first time I intentionally went to dinner alone. It was spontaneous. I was craving Clover's cucumber mint lemonade. I was on my way home to no one, so I called ahead and claimed a seat at the bar. Once there, I was hungry. Encouraged by the warm reception of my bartender, I peeked at the dinner menu, choosing the stuffed chicken breast I loved. When dinner was over and my drink was drained, I ordered a freshly made raspberry sorbet for dessert. Since that night, I have eaten many meals in restaurants on my own, near home and when traveling. For me, dining out is some combination of theater and self care — a luxury and a form of entertainment. It's a gift to experience the kind of care that comes in the form of food, when someone else is taking care of your needs, and even your wants. I began to realize that I was not alone in these feelings when I came across fabled food writer M.F.K. Fisher's work on dining alone. In her book An Alphabet For Gourmets, she writes: "I came to believe that since nobody else dared feed me as I wished to be fed, I must do it myself, and with as much aplomb as I could muster... I resolved to establish myself as a well-behaved female at one or two good restaurants, where I could dine alone at a pleasant table." In 1949, when Fisher's book was published, it was still very unusual to see a woman dining alone. She worried that they'd think she wouldn't tip well, or that she'd get drunk and haunt the bar, trying to get picked up. Stereotypically, it made sense for men to dine alone, especially if they didn't have spouses to prepare meals for them. Even now, it's easy to assume that people dining alone are on a business trip or in other ways at loose ends. For many people, it's hard to imagine that someone might choose to keep their own company. But is that really what's going on? Dining out is inherently a social act. Though I'll sit at a table from time to time, I prefer to perch on a barstool, chatting with my bartender, but also with anyone else who might be enjoying a solitary drink, or meal. Patricia Zirotti, owner with her husband of both Fleur de Sel in Post Falls and its sister creperie in Spokane, frequently serves guests dining alone, and she's noticed a trend. A new patron might request a table and bring a book, but often, as they become comfortable with the restaurant atmosphere, they request a seat at the bar. "They choose to be at the bar because they know eventually they're going to be surrounded by people who are like minded," she says. "There is that camaraderie and it almost develops into a friendship. Even though you don't know them very well, there is something very dear — for us to see them and for them to be seen and to be recognized." Though some fellow patrons might find it strange to see someone dining alone, gone are the days when those in the hospitality profession see anything strange about it. "It's even more special if someone is alone," says Zirotti. "Don't overthink it. The people on the other end will be gracious and they will take care of you. It's as much their treat as it is yours." Ben Poffenroth, co-owner of Casper Fry, Madeleine's Cafe & Patisserie and Durkin's Liquor Bar, recommends setting the tone for your dining alone experience up front. "When you sit down, if you just pull out your phone and that's all you do, then I know you don't really want to talk to somebody — you're just here to get a meal and get out," he says. "If you want to sit down and have a conversation with the bartender or server, keep your phone in your pocket. If you're here for an experience, let's do it." Zirotti's first personal experiences dining out alone came in her early 20s, as a young Frenchwoman in San Francisco, where she'd moved with her boyfriend and now husband, Laurent, the James Beard Award-nominated head chef of Fleur de Sel. The first few months were difficult, with Laurent working long hours. Zirotti met a woman in her 40s who gave her some advice she's carried since: "She said, 'Happiness does not come from the other person, it comes from within. The moment you realize that you can bring happiness to yourself, you're just going to be able to do so much more.'" That was enough catalyst for Zirotti. "I always thought: You have more fun if you are with someone and sharing it with that other person. It works at times when you are really well in sync and you have the same interests, but it doesn't always. The day you can do something by yourself and you enjoy it, it's just quite an amazing experience." For many people, including myself, it's easy to think that splurging on dinner out alone is overly self-indulgent. The original print version of this article was headlined "One's Company"